Over 30 shops, restaurants and services to serve you! OPEN 7 DAYS A WEEK with late night shopping Thursdays and Fridays. hub located 5 minutes east of downtown Trail with plenty of free parking and a welcoming atmosphere. A TRUE HOME AWAY FROM HOME FOR THOSE WHO KNOW AND APPRECIATE THE BEST. AMAZING FOOD, SIGNATURE DRINKS AND LEGENDARY SERVICE. Come explore everything the Kootenays have to offer! trail Community Guide is published annually by Black Press in partnership with the City of trail. this material, written or artistic, may not be reprinted or electronically reproduced in any way without the written consent of the publisher. 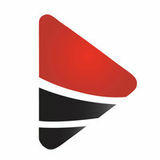 the opinions and statements in articles, columns and advertising are not necessarily those of the publisher or staff of Black Press. it is agreed by any display advertiser requesting space that the ownerâ&#x20AC;&#x2122;s responsibility, if any, for errors or omissions of any kind, is limited to the amount paid by the advertiser for that portion of the space as occupied by the incorrect item and there shall be no liability in any event greater than the amount paid for the advertisement. Beauty nestles here. Come see. Chair Roly Russell & the Regional District of Kootenay Boundary Board of Directors invite you to enjoy everything our region has to offer. Paterson/Frontier, WA open 24 hours Waneta/Boundary, WA open 9 a.m. to 5 p.m.
trail Hotspots (free high speed wireless service) include downtown along Bay Avenue, trail Memorial Centre, trail Aquatic & Leisure Centre, trail rivefront Centre or City Hall. open your device, click to web browser. Password is “guest” then click Accept. once at the City of trail website, you can then access the internet. the area has a moderate climate with low humidity, hot dry summers and relatively mild, yet snowy winters. the average daily maximum temperature in July is 28 C and the average minimum for January is -5.9 C with extreme lows down to -25.7 C. Annual sunshine averages 1,860 hours and average annual precipitation is 731 mm. ESCAPE TO Kootenay Lakeview Spa Resort & Event Centre for an experience unlike any other. From beautiful weddings and successful business retreats to family holidays and golf vacations; plus, everything in between. Kootenay Lakeview Spa Resort & Event Centre is the perfect getaway no matter the occasion. Whether you’re on the go, or wanting to dine with friends, Trail’s cafes, eateries and restaurants have what you’re craving. Come “wine down” with us! Love Love Italian Italian Food? Food? Italian family style style diningfeaturing featuring Italian family Italian family styledining dining featuring our famous famous spaghettidinner dinner and and our famousspaghetti spaghetti dinner and mouth-watering menu choices! mouth watering menu choices! mouth-watering menu choices! Pasta and so much more, like our West Coast style lunch specials. There are 19 campsites, the Gazebo located in the Day Picnic area can be rented for weddings, family gatherings, business parties ect. aTTRaCTIons & aMenITIes Join in to relax, work out, let loose or explore! the Columbia river skywalk is one of the longest pedestrian suspension bridges of its kind in North America at 1,000 feet (300 m) landing to landing! the bridge is part of the trans Canada trail society’s Great trail and spans the Columbia river from rotary Park in West trail to McQuarrie street in east trail. the bridge is bike and stroller friendly. As a tournament hub, trail’s parks host thousands of visitors annually — and for good reason! Looking for a more relaxed locale for playtime or a picnic? trail’s neighbourhood parks are the pride of the community! Meanwhile Gyro Park, Butler Park, Haley Park and Andy Bilesky Little League Park offer specialized recreational opportunities to the community at large. this italian-themed park, located in trail’s historic Gulch, is beautifully designed with lush grass, picnic tables, flower gardens, a fountain, and an il grotto area. Grab a picnic lunch and enjoy the ambiance. street parking available. Exhibitions Workshops Events & More! aRTs & CUlTURe trail offers a host of cultural experiences for all ages. enjoy live music in the beautiful Gyro Park. From June through August, the trail and district Arts Council and Kootenay savings bring in a variety of talented musicians for your enjoyment. View their events schedule, grab your lawn chair and bring a toonie for donation. Website: trail-arts.com 1090 Charles Lakes drive See page 32 for dates. Get a little taste of europe with a walking tour of trail’s historic rock walls, built to support the europeanstyle streets in West and east trail. the rigatoni ramble or the Haggis Hike will bring you face to face with the hundreds of rock walls, some 25 feet high, many of them carved by hand. Purchase a self-guided walking tour map prepared by the rock Wall Project enthusiastico society at the trail riverfront Centre at 1505 Bay Avenue. trail has 63 unique covered staircases, mainly in West trail. Built in the 1930s and 1940s, the staircases provided easier access to the downtown core. Fun fact: stacked atop one another, the staircases would equal 6,610 vertical feet or 1.25 miles (2 km)! if you’re looking for a workout with a side of culture, look no further! Chances are you’ll recognize a few names on the Home of Champions Monument, where we honour Greater trail’s outstanding achievers. Check out the inductees at trailhistory.com. You’ll be surprised who we can claim as ours! it proudly sits at 1199 Cedar Avenue in downtown trail, right outside Kootenay savings Credit union. For a complete listing of arts and culture events in the trail area, check out the trail & district Arts Council events calendar at trail-arts.com/events. From live performances by some of Canada’s top acts to colourful jazz sessions, culture is thriving in trail! For the active heritage lover, spend some time in downtown trail admiring the historically-themed murals and the many plaques featured on downtown buildings. Like what you see? A companion guide is available for purchase at trail riverfront Centre, complete with a map of plaque and mural locations. For more information on any building or mural, email the trail Museum & Archives staff or call 250-364-0829.
h with Bistro open for d dinner. SPECTACULAR RIVER AND MOUNTAIN VIEWS LICENSED BIRCHBANK BISTRO WITH LARGE COVERED DECK OPEN FOR BREAKFAST, LUNCH AND DINNER. Hit the links at the gorgeous Birchbank rossland-trail Country Club. enjoy the beautiful views of the Columbia river at this 18-hole course. After your round, enjoy the fully licensed Birchbank Bistro for one of their daily specials. Looking to book a special event? Contact the bistro manager at 250-693-5451. View other golf courses in the area at kootenaygolftrail.com. GeT oUTsIDe Connect with family and friends and enjoy the outdoors in Greater trail. this Community in Bloom and Home of Champions community is engaging in every season and there is so much to see and do. We are located in BC’s Lower Columbia region where outdoor recreation opportunities abound. 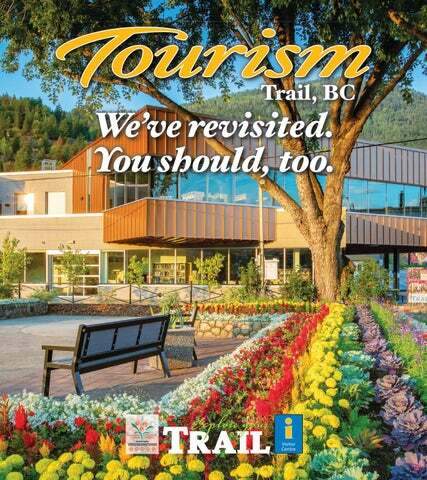 We hope you enjoy the rich history and outdoor beauty that make trail such a remarkable place to live, work and play. Columbia river fishing is easily accessible in trail and offers exceptional walleye, kokanee, bull trout and rainbow trout fishing. Check out kootenayangler.com for a complete list of fishing lakes and rivers in the region. Boaters can launch for free at the Gyro Park boat launch (no fee). simply walk the bridges and enjoy a stroll over the beautiful and scenic Columbia river skywalk. once across, continue along the banks of the Columbia river to the Victoria street Bridge and complete this quick and easy loop. this bridge is part of the trans Canada trail’s society’s Great trail and is also bike-friendly. the Gyro Park spray Park is the ideal place to be on a summer day. A concession and access to the Columbia river and its sandy beach make it easy to spend the day. in West Kootenay Real Estate since 1996. THINKING OF MOVING? H������ ��� ���, ���� ��� ���� ���� ������. EVENTS & FESTIVALS Annual events are widely celebrated in Trail and we invite you to play along during your stay! For other events happening in the area, view trail.ca/Events or rosslandevents.ca. SATURDAY, May 4, 2019, 10 A.M. TO 5 P.M. This event at the Trail Memorial Centre gives you access to over 70 exhibitors, a farmers’ market, a full day of expert speakers, consultations and demonstrations, all geared towards eating right, living well and staying healthy. It’s a one-stop shop to learn more about traditional wellness services and activities, sample products, explore healthy alternatives and engage directly with experts. View the event site at kootenayhealthylifestylesexpo.com. Music in the Park June 13 to August 29 on Thursdays Enjoy live music in the beautiful Gyro Park. From June through August, the Trail and District Arts Council and Kootenay Savings bring in a variety of talented musicians for your enjoyment. View trail-arts.com/ events, grab your lawn chair and bring a toonie for donation. July 18 and August 8 feature local food trucks. Storm the Stairs Run/Walk Saturday, September 28, 2019, 10 a.m. to 1 p.m. Storm the Stairs is the most unique fitness challenge (or a friendly fitness walk) in BC. The course features two routes, The Express, 18 staircases (1,495 steps) and The Grande, 19 staircases (1,618 steps). The Grande route now includes the Victoria Street Bridge and the Columbia River Skywalk. While enjoying this challenge, runners and walkers experience scenic views of the Columbia River and the historic rock walls of West Trail. Spooktacular Saturday, October 26, 2019, 11 a.m. to 3 p.m. Get spooky in downtown Trail as the community comes together for its annual Halloween celebration. Outdoor fun, downtown trick or treat, costume contest, food and more. Check trail.ca/events for more information. SATURDAY, June 15, 2019, 10 A.M. TO 3 P.M. Trail’s Esplanade will host the West Kootenay Smoke ‘n’ Steel Auto Club from 10 a.m. to 3 p.m. Car lovers of all ages are invited to enjoy this family-friendly event. Check smokensteelcarclub.com for more info. Saturday, December 14, 2019 at 5 p.m. Santa makes an appearance in downtown Trail! Don’t forget a candy bag for all your loot. Parade starts at 5 p.m. Check trail.ca/events for more information. HealTH, GoVeRnMenT anD PUblIC seRVICes sometimes, things happen on holiday. We have you covered in the event of an injury or illness, a lost piece of identification or if you simply require internet access! We get the importance of updating your Facebook status or posting a new photo! the City of trail provides access to free hot spots at City Hall, the trail Aquatic and Leisure Centre, the trail riverfront Centre, the Memorial Centre, and on Bay Avenue. don’t waste your precious data! QUaInT To essenTIal sHoPPInG Whether you’re looking for the perfect gift or just a basic necessity, trail’s shops can set you up. explore trail’s three main shopping areas. in trail’s downtown core and the Gulch, you will find a grocery store, two pharmacies and many specialty shops including imported italian goods, clothing, shoes, gifts, sporting equipment and more. Looking for parking downtown? 2 hour / 4 hour / all day pay parking is available. Enjoy a specialty coffee or tea from our coffee bar! Like Us! East Trail’s shopping district offers a grocery store, some boutique shops and several medical offices. Waneta Junction is equipped with a shopping plaza offering a variety of stores, including a grocery store and a gas station, and several other large shops offering building supplies, sporting equipment and more. With natural healthy products like New Roots, Platinum Naturals, Prairie Naturals, Now products, Renewlife and Flora supplements, Andalou cosmetics and Aqua Oleum essential oils. Go beYonD While in trail, you may want to go beyond our great city to visit our friendly neighbours in the surrounding communitues, each offering unique attractions and amenities. travel times below are from trail by vehicle. Nestled in the crater of an ancient volcano at an elevation of 1,023 meters, rossland has one of the highest altitudes among Canadian cities. Get to this mountain town in 15 minutes. Website: tourismrossland.com. Rossland Red Mt. Inn & Suites is the perfect place to call home during your stay in the beautiful kootenays.